Who are the Calgary Zoo Interpreters? Who are zoo interpreters? 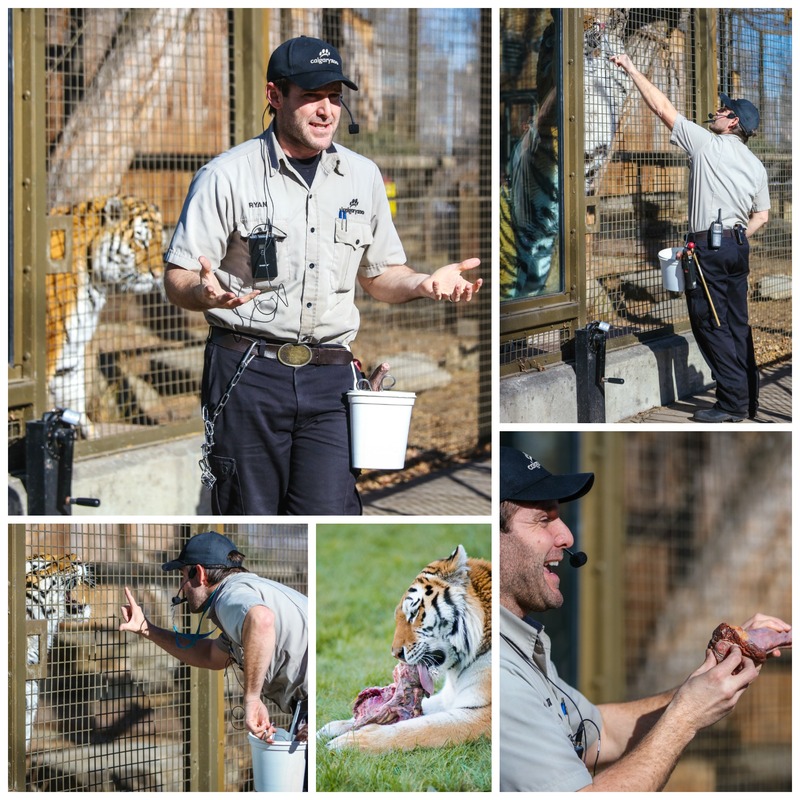 Zoo interpreters are knowledgeable people who talk to zoo guests about what is going on currently in the animal’s life. They do this in many ways: providing educational facts through show and tell, classes, and through interpreter talks. 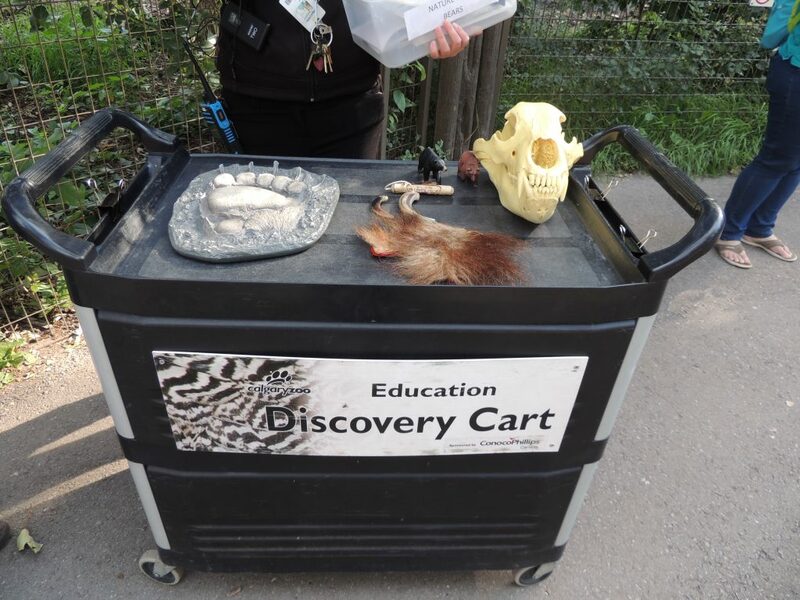 The amazing zoo staff use artifacts like skulls, teeth, feathers, and eggs to show the public. One of the zoo interpreter’s touch tables. Interpreters can talk about a great range of topics from bears to gorillas to plants and even insects. You name it, if it lives on the planet, or is at our zoo … the interpreters can most likely tell you about it. Now I know you can’t see all of the interpreter talks in one day, trust me … I’ve tried. So, I selected my top three interpreter talks – ones I think everyone should try to take in! If you want variety and are looking for the interpreter schedule, it can be found on the zoo website or displayed on boards located on the zoo grounds. 1. Animal Workout: This workout session starts at 3:30 p.m. every day. The animals get their daily dose of exercise through enrichment provided by the keepers. There is a different animal featured each day, such as on Wednesdays is the ‘giraffe Workout’ and on Sundays is the ‘penguin Workout’… it can be really hilarious! I choose this as my number one talk because I was at the penguin Animal Workout and as the keeper was setting down the sprinkler, one of the gentoo penguins decided to pick up the sprinkler and pull on it. I personally found this hilarious! 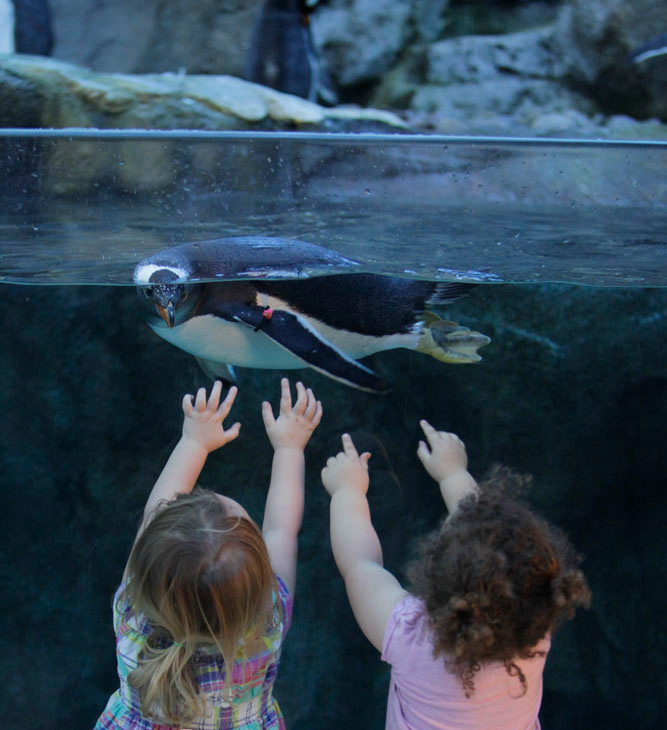 Penguin plunge is a great time on any given day, but if you’ve stopped by during an animal workout- get ready (you might get splashed)! 2. 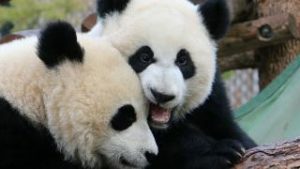 Carnivore Feed: This program starts 1:00 p.m. and is targeted towards the carnivores at the Calgary Zoo, hence the name. Like the Animal Workout there is a different animal for each day of the week, such as Tuesdays for the otters and Saturdays for Amur tigers. Be prepared because carnivores do eat meat, and in this feed the animals do get the natural sense of being in the wild, through raw carcass feeds. I choose this talk as my second choice because this talk can sometimes be funny! One time I went to the lion Carnivore Feed, and one of the male lions had a hold of the carcass – but was a good foot off the ground. I also really liked the cougar carnivore feed. 3. Tiger Training: These training sessions start daily at 11:30 a.m. and take place at the amur tiger habitat in the Eurasia section at the zoo. This program is not created to be entertainment for the public, but to show how the keepers work with the animals. The Amur tigers are trained to do some things like show their paws and teeth. These behaviors come in handy when the animals need to be seen by the vet, like us- we don’t come willing to the doctor or dentist! Since this is training and not a show, the tigers get to choose if they want to take part in the training. I sometimes wish school was like that… Tiger Training is my third and final choice because I learned that the adult tigers at the zoo deal with age related problems, so the training helps with those problems, which I think is awesome. Be sure to check the schedule for daily programs so you don’t miss out on this amazing opportunity. It will make your zoo visit even more special! Thanks to the keepers and interpreters of the Calgary Zoo for their dedicated work.